Fiah Kwesseu was born and raised in Trenton, NJ where she attended Blessed Sacrament School and Norte Dame High School, in Lawrenceville respectively. 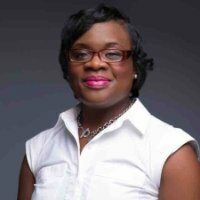 In 2005, Ms. Kwesseu received her Bachelor of Science degree in Business Administration from Georgian Court University located in Lakewood, NJ. Thereafter she completed her Masters in Business Administration (MBA) at the same educational institution in 2006. She joined the Georgian Court University’s Board of Trustees in May 2007, at the age of 24, making her the youngest member in history. Ms. Kwesseu was always interested in business and began her banking career at Wells Fargo Bank. Acquiring new business by identifying sale opportunities was important in this work environment. Tellers were assigned goals for the month and Ms. Kwesseu made her goals every month. She had the opportunity to be a part of a company wide sales competition and placed first in her region. In 2004, Ms. Kwesseu moved on to First Washington State Bank as a part-time Sales Associate. In this position, she was responsible for responding to inquiries by customers, analyzing account activity for growth opportunities and setting up new accounts. During the summers of 2003 and 2004, Ms. Kwesseu was presented the opportunity to work in the area of recreation. Ms. Kwesseu worked for the City of Trenton Department of Recreation, Natural Resources, and Culture where she had previously interned during her college years. Her first position was as a secretary and then a Coordinator for the Summer Food Service Program in 2005. This program offers food service i.e. breakfast and lunch for nearly 100 sites throughout Mercer County. She also served as a program administrator for the City’s Social Celebration Opportunity Organization & People (SCOOP) After-School and Saturday Program, which offers enrichment activities for students between the ages of 7 and 18. In 2006, after many years of dedicated service in recreation management, Ms. Kwesseu transitioned back into banking at PNC Bank. She took a position with the Small Business Segment as a Business Banker I, which offers services for businesses in the 1-10 million in annual sales. Ms. Kwesseu was promoted to a Bank Officer and Business Banker II in February 2009. Recently, Ms. Kwesseu received another promotion where she serves as a Treasury Management Officer, which offers advance-banking solutions for business clients. In 2014, Ms. Kwesseu accepted the role at the City of Trenton as Director of Recreation. She is responsible for all youth and family programs/events for the City of Trenton. Ms. Kwesseu lives in the City of Trenton and is a member of Kingdom Church in Ewing, NJ. She was appointed to serve on the Trenton Public School Board by Mayor Eric E. Jackson in 2014.